Rock Band for the Wii. 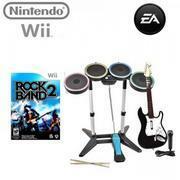 Includes game software, 2 guitars, 1 drum set, 1 microphone. Does not include Wii system.